What is left now, but to share the pics of that weekend that was. Chris Ariens, from sister publication TVNewser, hit up the pre and after parties, plus the hair-of-the dog Sunday parties, for a look into what everyone was up to before and after the scallops, the steak and the roast. At the ABC/Yahoo party pre-dinner party, Martha Raddatz poses for a shot with Gen. John Campbell, the outgoing commander of U.S. forces in Afghanistan. The dinner represented his last time in uniform while on duty. 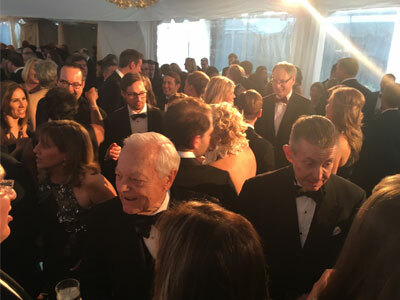 Meanwhile over at the CBS/Atlantic pre-dinner party, Nancy Cordes helps out with a Bernie Sanders pic. Spotted at the MSNBC after-party: Valerie Jarrett and Debbie Wasserman Schultz. And if the Jesse Watters/Ryan Grim fight is what you came for, here’s the link. CNN went industrial and playful with its brunch today, including a giant game of Connect Four. Spotted: Wolf Blitzer, Gloria Borger, Don Lemon, Jake Tapper, Jim Sciutto and Bryan Cranston.